Join us on 12th August, donate, contribute, get involved! 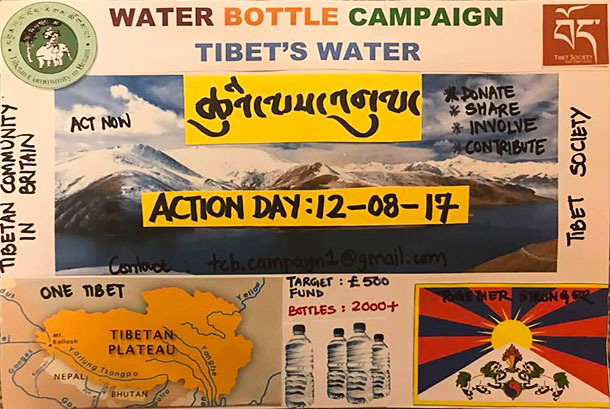 There will be photo opportunities of Tibetans and supporters handing out leaflets and water bottles and can interview people on the day from 11:30 – 14:00. Tibetan Community in Britain demands the termination of this unholy and unethical partnership in torturing Tibetans further and save long standing reputation image of Liverpool Football Club. London — Tibetan Community in Britain will organise a campaign to raise awareness about Tibet’s water resources and handing out leaflets about Tibet Water Resources Limited, a Chinese company that recently signed a deal with Liverpool FC. “There will be water distribution reception Watford FC’s opening match against Liverpool FC on Saturday 12 August 2017. Members of Tibetan Community in Britain will at Vicarage Road this Saturday for the opening Premiership match between Watford FC and Liverpool FC,” the Tibetan Community said in a statement issued on August 11, 2017. Tibetan Community in Britain demands the termination of this unholy and unethical partnership in torturing Tibetans further and save long standing reputation image of the club. There will be photo opportunities of Tibetans and supporters handing out leaflets and water bottles and can interview people on the day from 11:30 – 14:00. London — Tibetan Community in Britain will organise a campaign to raise awareness about Tibet’s water resources and handing out leaflets about Tibet Water Resources Limited, a Chinese company that recently signed a deal with Liverpool FC.”There will be water distribution reception Watford FC’s opening match against Liverpool FC on Saturday 12 August 2017. Members of Tibetan Community in Britain will at Vicarage Road this Saturday for the opening Premiership match between Watford FC and Liverpool FC,” the Tibetan Community said in a statement issued on August 11, 2017. This entry was posted in #environment, Keep Tibet Alive, Tibet Water Awareness, TibetWater and tagged #environment, #Football, #KeepTibetAlive, #LFC, #Liverpool, #TibetSociety, #TibetsRiversAsiasLifeline, #TibetWaterAwareness, #TibetWaterAwareness#TibetWater, #VicarageRoad, #waterbottlecampaign, #WatfordFC, #WATvLIV, Campaign, Pempa Lobsang, Tibet Water Awareness, Tibetan Community UK, TibetWater, Watford. Bookmark the permalink.